We study the problem of finding a maximum vertex-subset S of a given graph G such that the subgraph G[S] induced by S is r-regular for a prescribed degree r ≥ 0. We also consider a variant of the problem which requires G[S] to be r-regular and connected. 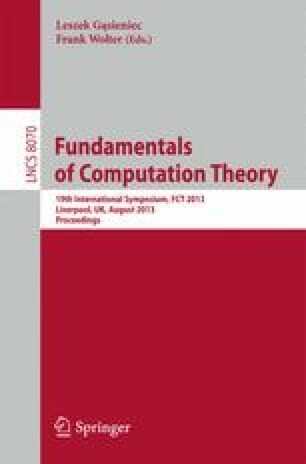 Both problems are known to be NP-hard even to approximate for a fixed constant r. In this paper, we thus consider the problems whose input graphs are restricted to some special classes of graphs. We first show that the problems are still NP-hard to approximate even if r is a fixed constant and the input graph is either bipartite or planar. On the other hand, both problems are tractable for graphs having tree-like structures, as follows. We give linear-time algorithms to solve the problems for graphs with bounded treewidth; we note that the hidden constant factor of our running time is just a single exponential of the treewidth. Furthermore, both problems are solvable in polynomial time for chordal graphs. This work is partially supported by JSPS KAKENHI Grant Numbers 23500020 (E. Miyano), 25330003 (T. Ito) and 25330018 (Y. Asahiro).